We were hungry that night. We walked the 3 kilometers from our campsite to the village to buy some food. It had rained, heavily. The little road was more or less damaged. It started to get dark. We passed a restaurant in the village, where we spot a table filled with vegetarian dishes. Innumerable mezes, stews, salads and fresh bread, enough for at least 20 or 30 people. It was obvious that there was a private party about to begin. But, we couldn’t stop ourselves from asking if it was possible to buy a plate. 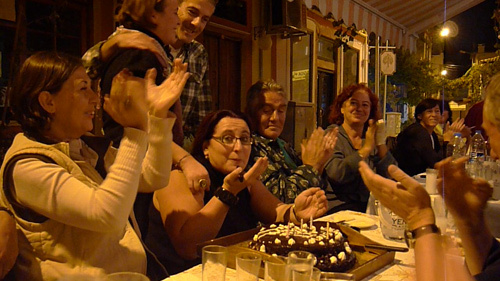 That’s how we got invited to join a Turkish birthday party in Ayvalik. People came from everywhere. Some spoke English, some didn’t. We communicated in every way we could. We sang “Happy Birthday” in Swedish, we laughed, we ate, we drank. In the end of the night, somebody offered us a drive home (luckily, since we could barely walk after the most amazing meal we’ve had for months), provided us with a few kilos of fresh mandarins and bread, and in our pocket we had a note with an invitation for brunch the day after. The world is a friendly place! This entry was posted in Adventure Excerpts on November 1, 2010 by mangomanjaro. Bara bra. That’s amazing! If you want to pick a single word to describe you trip, it could be TRUST. You trust people would take you from city to city when hitchhiking. You trust people would offer their home to stay. You trust people would share food when hungry. You trust nothing will miss for you two when you give up everything in Sverige. You trust people, so people trust back. What a great experience! We trust you to pimp your life even harder than you already did, looking forward to here more about it. I spend a lot of time giving talks about my travels round the world (eg – http://www.dolectures.com/speakers/speakers-2009/alastair-humphreys) and one thing I always talk about is that The World is a Good Place. So I REALLY enjoyed your post! Such a good reminder that there are good people in this world. This is my first time visiting your blog and I’m looking forward to reading more of your posts! Thank you very much Joya, we are happy to hear you like it!